Since I’m an Internet Research Geek for a living, it’s only fitting that I found Marina online, through a rescue group. I wanted to find an Australian Cattle Dog companion for her in hope that the energy level and personality would be a match. Once again, I went online and searched through dog rescue groups. I was surprised to find few if any matches in the San Diego area. After a while of unproductive searching, I decided to expand the area to include Los Angeles Metro. 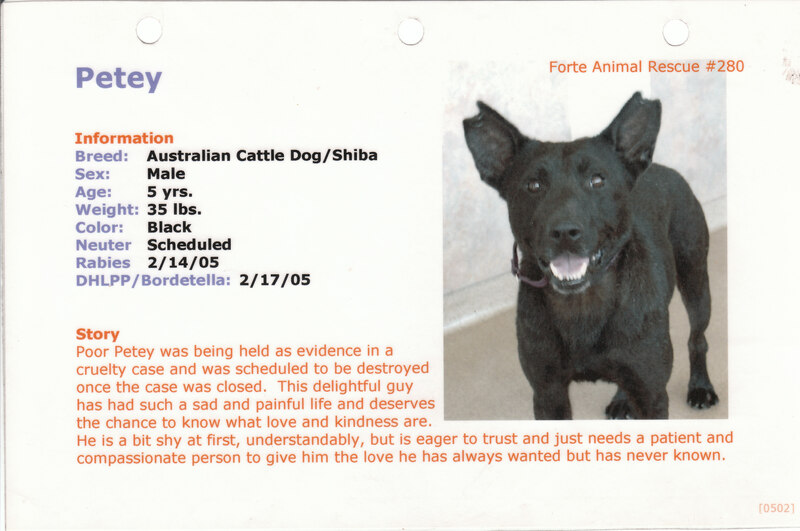 It was there that I found myself looking into the hopeful eyes of a black Australian Cattle Dog mix named Petey. The attached Picture and story is what had me hopelessly hooked….. I called the number listed and was directed to his Foster Mom. She let me know that Petey was shy and sweet, but no one had seemed to show interest in adopting him. From her description, he definitely sounded like someone I could work with. I let her know that we were going to be going up to L.A. for Thanksgiving and offered to stop by if it worked with her schedule. Thankfully, she was very receptive and when she gave me her address, I was amazed that it was less than a mile from where we would spending Thanksgiving. It was already sounding like something meant to be….